A Tale of Two Headphones / Giveaway! I’ve recently had the opportunity to try out two very different types of headphones – and what I concluded was that they were actually best used in tandem. But before we begin this oh-so-scientific discussion, let’s review the parts of the ear. Earhoox are a brand new company, and they designed their headphones specifically to allow ambient noise. I like them already! I am quite a stickler about only listening to music / wearing headphones if you can hear everything around you, particularly after seeing a runner get hit by a car last year. Too many people wear in-ear headphones to run outside, and even if you’re in a car-free area, it is dangerous to the other bikers and runners around you. Fortunately, Earhoox not only solve that problem, but also do it in an extremely comfortable manner. 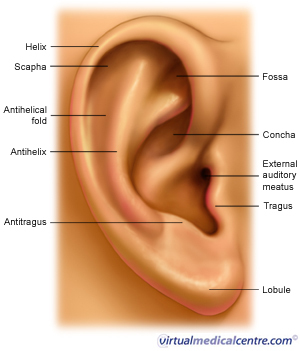 While they do sit inside your ear and don’t have anything that goes up and around the helix (see, told you I would use the technical terms! ), the little rubber hook can either be wrapped around your concha or smushed inside your tragus to provide a perfect fit. The hook feature helps them to stay in quite well without having to jam the bud all the way inside – so you get ambient noise as well as your music in the background. (Now, if they could just invent something to prevent dumb runners from turning the volume up so loud that the ambient noise still can’t be heard…) Of course, the downside of this feature is that if you are using them in a noisy location (e.g., on a plane, on a treadmill at a crowded gym), it’s not easy to hear your music. This is why I recommend the Yurbuds for such situations, and the Earhoox for outside and/or environments where you need to be alert. One other great thing about the Earhoox is that instead of being full headphones, they are actually little endcaps that go on top of standard earbuds. (You know, the kind you get with new Apple products or as giveaways in race kits and at college career fairs.) I don’t know about you, but I have about a dozen pairs of those cheap headphones sitting at home, and I never wear them because they’re not comfortable, don’t fit my ear, always fall out, and don’t allow any ambient noise, since I jam them into my ears as hard as I can to get them to stay. But adding the soft, flexible rubber of Earhoox helps you to get a great fit, and makes them so comfortable that you almost forget you have them in. Finally, a use for those headphones! On the other side of the headphone spectrum, we have Yurbuds. Despite Yurbuds claiming that they, like Earhoox, are designed to not block ambient noise, I did not find that to be the case. On the contrary – the Yurbuds’ hard rubber exterior blocked most of the ambient sound, so while I got very clear sound from my music, I couldn’t hear a thing outside of it. The Yurbuds were perfect for dulling out the noise of the baby crying a few rows back on my evening flight, but I would definitely not recommend them outside/in an open environment. However, where the Yurbuds excel is in staying put – they have a cool form factor where you put them in your ears and then turn them to the side to get them to “lock in.” Once inserted, you can actually tug on the cord and they will still stay in place. That’s a big plus for someone like me, who is inherently klutzy about flailing my arms around and accidentally pulling my headphones out! These are awesome for weight lifting in a noisy gym, where I’m likely to catch my headphones on the upswing of the barbell – no more losing my tunes when I work out. Yurbuds are quite a bit pricier than Earhoox, but they come as a full set of headphones – and with other snazzy features like being water/sweat resistant. My cheapo headphones certainly won’t do that! That said, at $29.99 a pop, they are a bit more expensive to replace if something does go wrong or if I lose them. In the end, I think it’s important to have both of these styles of headphones in your arsenal. Just like you choose different outfits/shoes based on the type of workout you’re doing, you should pick your headphones to fit your activity and location. Running a race or heading for an outdoor workout? Check out Earhoox. Somewhere where you want some quiet and maybe to watch a TV show? Yurbuds are your go-to. As a bonus, Earhoox has provided me with several pairs of their product to give away to readers! To enter, leave a comment telling me what the most important feature of headphones is to you. Bonus extra entry if you tweet about the entry using this link, and then leave a separate comment letting me know that you did so. Contest will run through Friday, January 11 at 5pm ET, at which time a winner will be chosen. Contest entry is open to all residents of the US and Canada. Thank you all for sharing your thoughts on headphones! Note: Earhoox and Yurbuds provided me with product samples, but I received no other compensation for this review, nor was I pressured to write a positive review. All opinions expressed in this review are my own. I like headphones that are comfortable. Those standard ones really make my ears hurt! The biggest criteria for me is getting them to stay in my ears! Even though I’m big, I have really small ears. I have such a hard time with earbuds. I’ve tried Yurbuds and while they do stay in, they hurt my ears. I have a very hard time finding ones that actually stay in my ears so that is super important for me! I like that they are comfortable and they are not too expensive. I’m one of the fortunate ones where ear buds stay in just fine while running. The most important thing about any earphone is the sound. If it sounds like your listening through a tin can, then it doesn’t matter how well it fits or doesn’t fit, you won’t be satisfied. Very interesting, I like the earhoox concept for everyday use cause my iPhone headphones are always falling out. I also agree that for running, exercise or everyday activity outside it is important to hear the ambient noise around you for safety sakes. However, when traveling I love my noise isolating Sleek-Audio headphones but I don’t use them as everyday headphones due to the total lack of outside noise. The most important feature is making sure it doesn’t fall out of my ear when I am running!! The most important feature is that they stay put while I’m running! My top two things I look for in earphones are price and ability to stay in my ears. I’ve tried Yurbuds before, but was never overly impressed for the price point. I would be interested in trying the Earhooks since I do run outside frequently and like to be aware of my surroundings. I’ve had a pair of earhoox for a few months now- as an off road cyclist with all the jolting and jostling around, and the spills I sometimes take, I can tell you that my earbuds with the earhoox did not fall out once. These things stay in the ear throughout sudden jerks and movement. I even hit my head on the ground (wearing a helmet of course) and the earhoox stayed in. I am constantly pushing my ear buds back in my ear as I go, drives me crazy. I’ve always thought it was just the shape of my ear. I like the idea of the earhoox because the ear buds actually start hurting after a few miles on the road, it would be nice to have something that I didn’t have to keep jamming into my ear. They’ve gotta stay in while I am running! So important – I get so annoyed when they fall out and I have to keep messing with them during a run! For me its all about comfort! I look for comfort, and not so big that they want to slip off when you turn your head, no tinny noise. Okay. I’ll bite. I think the most important factor in headphones is letting in some ambient noise. If not, then I might get hit by a mountain biker! Yikes! The most important feature to me is sound quality followered by comfort and then by safety. I always go for comfort! The most important part is that they stay comfortably in my ear so I don’t have to mess with them the whole time I run. Comfort! If they hear my ears I won’t use them regardless of sound quality, price or style! I need headphones that don’t fall out! I tweeted about this, so give me the stuff! I love headphones that are comfortable! I’m a sweaty runner, so I need headphones that don’t wuss out after a little liquid exposure. Thanks for the feedback, Norma! I am not a huge picture person so for the time being, will probably stick with mostly text. However, I really appreciate your honesty.